August 8, 2018, FREDERICTON (GNB) – Cvent, a meetings, events and hospitality management technology provider, will expand its operations in Fredericton and create up to 25 new jobs within the next three years with support from the provincial government. Cvent uses integrated technology solutions to help event professionals and marketers organize their events, engage audiences and measure and analyze results. The company also offers digital marketing tools and software solutions to help people in the hospitality industry. To support its expansion, the company will move its Fredericton operations to a new 1,400-square metre office downtown this November. Cvent is eligible for an investment of $385,000 from Opportunities NB, which is a Crown corporation that seeks to attract and support opportunities to grow the economy and create jobs. It provides support services for businesses across the province. The investment comes in the form of payroll rebates, which are performance-based and only given to a company once it has created and maintained the jobs for at least one year and provided proof of salary levels and employment. It is estimated that creating up to 25 jobs would contribute $6.75 million to the province’s GDP over three years and generate $507,500 in provincial taxes over that same period. Cvent employs more than 90 New Brunswickers, most of whom work at the company’s offices in Fredericton’s Knowledge Park. 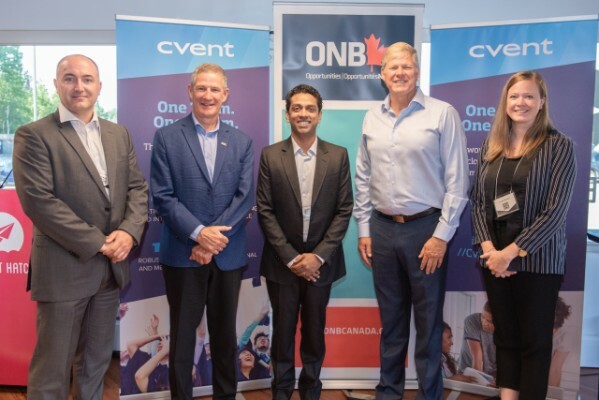 From left: Tyson Johnson, chief operating officer of CyberNB; Stephen Lund, CEO of Opportunities NB; Pardeep Mannakkara, senior vice-president and chief information officer of Cvent; deputy premier Stephen Horsman; and Erin Clendenning, business development officer with Opportunities NB.